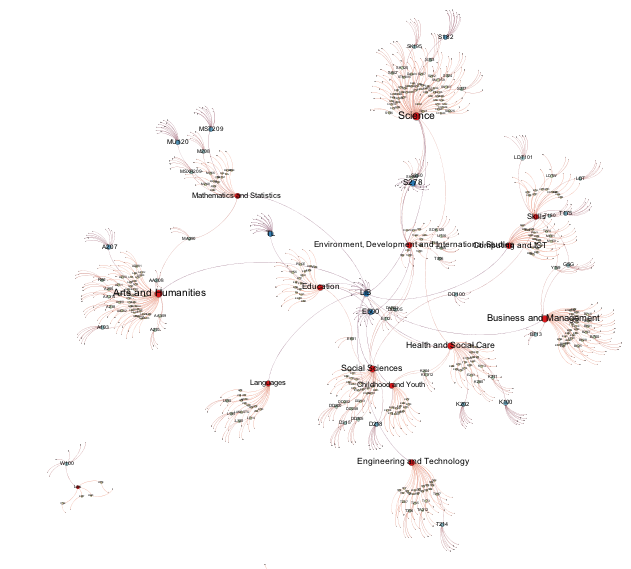 How do you visualise data scraped from the web using Scraperwiki as a network using a graph visualisation tool such as Gephi? One way is to import the a two-dimensional data table (i.e. a CSV file) exported from Scraperwiki into Gephi using the Data Explorer, but at times this can be a little fiddly and may require you to mess around with column names to make sure they’re the names Gephi expects. Another way is to get the data into a graph based representation using an appropriate file format such as GEXF or GraphML that can be loaded directly (and unambiguously) into Gephi or other network analysis and visualisation tools. The inspiration for this demo comes from a couple of things: firstly, noticing that networkx is one of the third party supported libraries on ScraperWiki (as of last night, I think the igraph library is also available; thanks @frabcus ;-); secondly, having broken ground for myself on how to get Scraperwiki views to emit data feeds rather than HTML pages (eg OpenLearn Glossary Items as a JSON feed). The data is available from the openlearn-units scraper in the table swdata. The columns of interest are name, parentCourseCode, topic and unitcode. What I’m going to do is generate a graph file that represents which unitcodes are associated with which parentCourseCodes, and which topics are associated with each parentCourseCode. We can then visualise a network that shows parentCourseCodes by topic, along with the child (unitcode) course units generated from each Open University parent course (parentCourseCode). Having generated a representation of the data as a graph using networkx, we now need to export the data. networkx supports a variety of export formats, including GEXF. Looking at the documentation for the GEXF exporter, we see that it offers methods for exporting the GEXF representation to a file. But for scraperwiki, we want to just print out a representation of the file, not actually save the printed representation of the graph to a file. So how do we get hold of an XML representation of the GEXF formatted data so we can print it out? A peek into the source code for the GEXF exporter (other exporter file sources here) suggests that the functions we need can be found in the networkx.readwrite.gexf file: a constructor (GEXFWriter), and a method for loading in the graph (.add_graph()). An XML representation of the file can then be obtained and printed out using the ElementTree tostring function. Note the use of the scraperwiki.utils.httpresponseheader to set the MIMEtype of the view. If we don’t do this, scraperwiki will by default publish an HTML page view, along with a Scraperwiki logo embedded in the page. Here’s the full code for the view. Save this file with a .gexf suffix and you can then open the file directly into Gephi. Hopefully, what this post shows is how you can generate your own, potentially complex, output file formats within Scraperwiki that can then be imported directly into other tools. PS see also Exporting and Displaying Scraperwiki Datasets Using the Google Visualisation API, which shows how to generate a Google Visualisation API JSON from Scraperwiki, allowing for the quick and easy generation of charts and tables using Google Visualisation API components. This entry was posted in online journalism and tagged onlinejournalismblog, scraperwiki, Tinkering on April 3, 2012 by Paul Bradshaw.